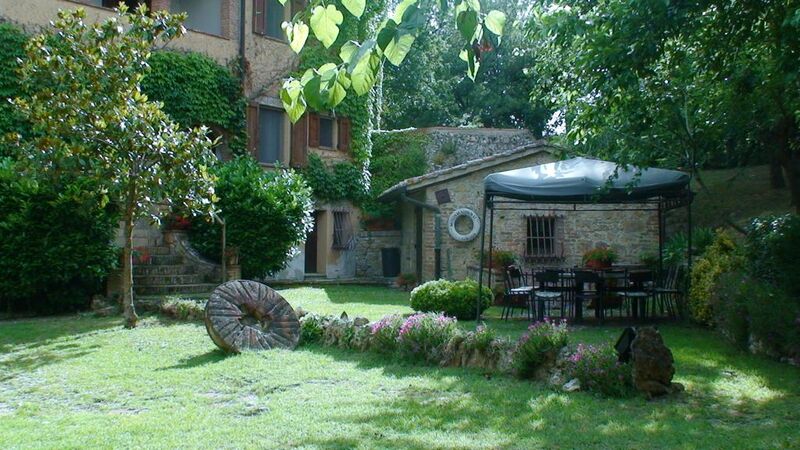 Are you looking for a peaceful and cozy gateway in the heart of the Tuscan country? Come and stay with us at Tenuta di Argiano in Montepulciano! Our family will welcome you in a beautiful estate surrounded by olive groves and vineyards, where we grow grapes for our high quality local wine, Chianti Superiore D.O.C.G. Staying with us at Tenuta di Argiano, you will experience the warm and authentic hospitality of aTuscan family, taste delicious local cuisine and discover the enchanting Tuscan wine country. We look forward to having you here!The estate consists of a beautiful villa, the adjacent family chapel, outhouses and three guest apartments with wifi, tv, A/C and all comforts. Each apartment offers a spacious master bedroom, a bathroom with towels, a fully-equipped kitchen and a large living room. Outside, there is pleasant garden, a picnic area equipped with grill and table, and a swimming pool for you to enjoy during the warm season. Free parking is available for our guests on premises. Tenuta di Argiano will be your home away from home. We grant our guest full access to our property, including the garden, the grill area and the swimming pool. You are welcome to taste our extra-virgin olive oil and our wines. We love to spend time with our guests and share with them tips and suggestions on how to make the most of their stay in Tuscany. We will be more than happy to give you all the information you need on Montepulciano wine country and its surroundings, and to help you arrange your visits and activities. Montepulciano is a Renaissance town on a hilltop between two valleys, Val di Chiana and Val d'Orcia. Montepulciano wine country is world famous, thanks to its charming landscapes and its excellent wines, Vino Nobile di Montepulciano and Rosso di Montepulciano. The mediaeval towns of Pienza, Cortona and Siena are a short drive away. The thermal baths of Chianciano are also very easy to reach. Cities sightseeing, bike tours in the country, wineries tours and wine tastings, thermal bathing: whatever your passions are, you will find plenty of activities to do! Tenuta di Argiano is located in the heart of Montepulciano wine country and is easily reachable from A1 highway. We are a short drive away from Pienza, Cortona and Monticchiello. Day trips to to Siena, Arezzo and Florence are also easy to arrange. Driving a car is recommended to get around easily and get the most of your stay. Bikes for rent are available. Pets are welcome, pet fee is €30 per week. "Bon séjour a argiano,belle piscine,trés bon vins du patron,idéal pour visiter le sud de la toscane et l''umbria. "Très belle location, décorée avec goût, très au calme, dans un environnement de verdure très soigné; gardiens sur place aimables et accueillants; grande piscine . Petits bémols, il y a pas mal de changements de locataires, pas forcément conviviaux et les installations commencent à vieillir un peu (piscine,batterie de cuisine, douche)mais dans l''ensemble nous avons passé 2 semaines très reposantes et très agréables avec un temps superbe et la location est proche de multiples sites à visiter." Take the highway A1 (Rome-Florence-Milan) and exit at Chiusi-Chianciano. Turn right and follow signs to Chiusi. After 2.5 km turn left and follow signs for Chianciano Terme and Montallese. Paths 6.7 km you reach the small village of Montallese, you pass the train station, after which turn left to Chianciano Terme. After 2.5 km turn right at the House Cantoniera ANAS. Take the dirt road for about 2.4 miles until you reach the Farm Argiano, a big yellow house on the left. Breakfast on request Euro 10 per day. Swimming pool in the garden, relax. Useful if you would ride a bicycle, horse and go to the spa. The path of clean-lane road that connects Arezzo to Chiusi. The thermal baths of Montepulciano send me information and promotions shortly. OTHER Spas: BATHS BATHS SAN FILIPPO, SAN CASCIANO BATHS BATHS BATHS Rapolano Terme. Closed - National Archaeological Museum, Cathedral Museum and Etruscan tunnels. Montepulciano - Museum, Art Gallery "PF Crociani". Montalcino - Civic and Diocesan Museum of Sacred Art. Pienza - Diocesan Museum, Museum of Palazzo Piccolomini. Tariffe scontate in relazione alla durata, Tariffe in funzione del numero di persone, Deposito cauzionale, Caparra richiesta alla prenotazione, Consegna delle chiavi da parte del Proprietario non presente in loco Riscaldamento è a consumo 5 euro / metro cubo , deposito di 250 euro.